Your cat is likely flatulent all the time and you probably haven’t even noticed. However, if you start seeing or smelling gassiness in your cat, then that is probably an indication that you need to do something about it. It may not be a major problem, but it could mean that your cat needs a change of diet or some minor medical help to right their gassy tummy. Excessive gas can be a danger to your cat, especially if it smells bad, as that usually indicates a gastrointestinal issue that needs to be dealt with. Flatulence can be caused by a high fiber diet, a diet that consists of greasy or otherwise unhealthy foods, lactose intolerance, hairballs and poor eating habits. So, just because your cat has gas, that doesn’t mean you have a major problem on your hands. Treatment varies based on what is causing the gassiness in the first place. Your cat’s vet may recommend that you change out the diet or that you just encourage different eating habits from your cat. You may be told to get your cat out more and ensure that your furry friend exercises regularly. Just keep in mind that you should not try to fix the problem on your own, and professional advice can go a long way toward getting rid of the gassiness. One of the most overlooked causes of cat gassiness is food allergies. If dairy disagrees with your cat, then your feline friend may start experiencing gas. You may see bloody stool, bloating, a disinterest in food, vomiting, diarrhea and other signs that the food your cat is eating isn’t agreeing with it. Dairy is one of the big culprits, but there are others. 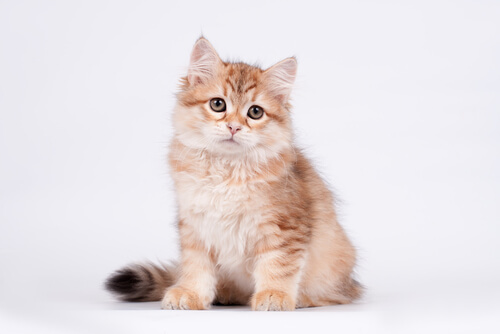 Grains, such as rice and wheat, can trigger food allergies in cats. Your cat may also be allergic to soy, potato or even fish. The veterinarian will likely ask that you cut a few things out of your cat’s diet and then slowly introduce them one at a time to determine what is causing the indigestion, gassiness and other health problems. Cat food allergies are more and more common these days, simply because of all the artificial flavors put into cat foods, the same ingredients being used in most commercial cat foods and the prevalence of pesticides in growing the ingredients that make up cat food. If you aren’t sure what is causing your cat to have indigestion, then get an expert on it and get your cat on a healthier diet right away. There are some foods that are specially designed for gassy cats, and we want to show you a few of the best ones. Let’s start with the dry options. One of the biggest causes of cat flatulence is food allergies, and a limited ingredient cat food like this can be the perfect way to cut out those allergens and give your cat a more pleasant meal. Wholesome meat and veggies make up for the grains, creating a balanced meal that has all the nutrients a growing cat needs. There are also some great flavor varieties among the different options, so it should not be too hard to find something that’s palatable to your cat. You won’t be able to make every cat happy with the same food, though. The limited ingredients mean that your cat may not be used to this kind of food and may reject it. Thankfully, the manufacturers will give you your money back if you aren’t satisfied (or your cat just doesn’t like it). If your cat does enjoy it, though, the they will be treated to a food that’s nourishing and that gives them a sleek, shiny coat. BLUE has created a limited ingredient, grain-free option for cats that keeps allergens to a minimum while providing a balanced diet for cats. It’s ideal for cats that have digestive issues and may not be able to eat a lot of different foods, and it gives you a way to limit irritants while providing your cats with everything they need. It utilizes only natural ingredients, so you won’t find artificial flavoring, colors or preservatives anywhere in the ingredient list. Natural components tend to make the food more palatable and more easily digestible for your cat, as well as providing a healthy weight for them. All of BLUE’s products are tested rigorously, making them some of the safest and most proven products on the market. This specially formulated dry cat food is designed to have only a few protein sources to keep allergens and irritants to a minimum. The ingredient list contains no grains, no artificial flavoring and no artificial colors. 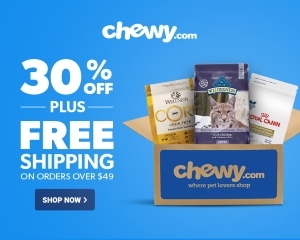 The ingredients that are included are there for specific reasons- to provide ample protein for an active cat, to meet the dietary needs of your pet and to provide it with a glossy, healthy coat of fur. 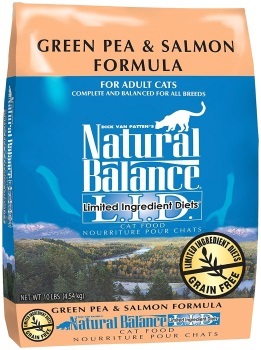 Limited ingredients are a great option for gassy cats with wet cat food as well, and Natural Balance has a few options for you there too. As with their other limited ingredient foods, there are no grains in this, and it is made from the highest quality products. Wild meats like venison give your cat taste of meat they might not otherwise be able to enjoy if you just fed them commercial cat food. The lack of artificial ingredient ensures clean, natural food for your cat that is less likely to cause indigestion or trigger allergies. 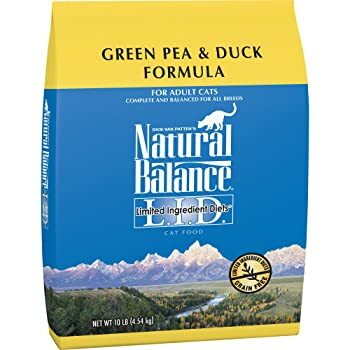 Natural Balance has a reputation for safety testing, and each of their foods, including this one, is put through nine different tests to ensure it is right for your cat. Of course, that doesn’t mean your cat is going to be happy with it. 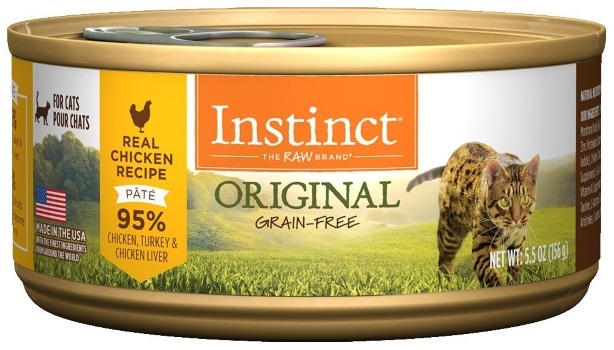 The exotic meats, wholesome ingredients and lack of artificial flavoring can actually make the food less than appealing to cats why have been raised on nothing but the biggest brands in commercial cat food. You may want to go for the smaller sizes until you are sure your cat likes this. Nature’s Variety produces this limited ingredient cat food with about every meat flavor you can think of. Even the pickiest cats ought to be able to fall in love with one of their options. Duck, rabbit, salmon, lamb, beef and chicken give your cat a huge variety of healthy, grain free food. 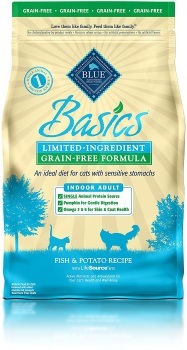 There are no potatoes, corn, soy or wheat in these products, making them ideal for cats with digestive problems. This diet variety may not be right for every cat, though. If your cat is already looking a bit thin, then you may want something with more carbs for them. High energy cats may require something with more protein as well, but most cats should be fine with the nutritional value and energy provision of this cat food. Buyers should note that the formula changed recently, and that can mean that cats that loved this food or did well on it before may not be so amenable to it anymore. Most cats do just fine with this diet option, though. 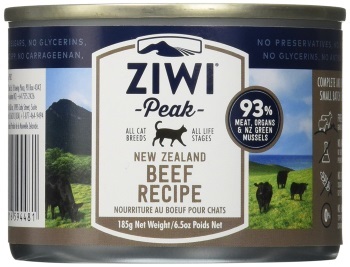 With ZiwiPeak cat food, you always get grass fed meat and a host of natural ingredients. This cat food is always of very high quality and made without the use of artificial components. 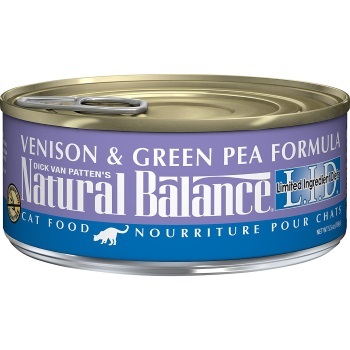 If you aren’t sure how sensitive your cat is to certain foods, then this can be a great product to start with. The chunky loaf style of the meat is very attractive to cats, as it gives them food that’s appealing to bite into instead of mushy food that they can’t get much enjoyment out of. There is no filler here, and you really do get a lot of value for your money, as you won’t find a bunch of gravy taking up the space in the can. On the downside, not all cats are going to like it, but that’s true of even the finest cat food. Some cats will just be picky about what they eat, and ZiwiPeak’s offerings may not be to their liking. There are lots of ways to help your cat get over their gassiness, but it often comes down to dieting. Giving your cat the right kind of food can make a huge difference in not only how gassy they are, but also how much energy they have and how they feel. If you want your cat to live their best life, then you will try to eliminate gassiness. Hopefully, some of the cat food options we have detailed for you here will be palatable to your cat and affordable for you. We tried to pick out the best choices for gas-eliminating foods, but each cat is different, and we do recommend that you take your cat to the vet if you think it has a flatulence problem. It could be that they need more than just a change in diet, and only your cat’s vet will be able to determine that. You should realize, though, that gassiness can be a serious problem and it needs to be addressed rather than ignored in hopes that it will go away on its own. Pay attention to your cat and ensure that it is getting the proper diet for a long and happy life.